CMA Music Fest may be over, but the industry keeps on partying. 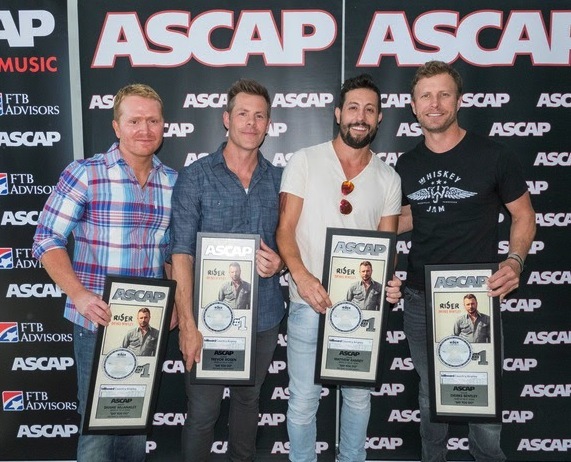 Yesterday (June 15) ASCAP hosted a No. 1 party for Dierks Bentley’s “Say You Do.” Immediately afterward, his UMG Nashville labelmate Kacey Musgraves celebrated her new album with a listening party at Play, but that’s another story. “Say You Do” is Bentley’s 13th career No. 1, and the first one he didn’t write. Accordingly, he thanked his label team and album executive producer Arturo Buenahora for conducting an extensive song search for Riser. This is the third No. 1 from the project. The title track and follow-up single went to radio yesterday. “Say You Do” was written by Shane McAnally, Trevor Rosen and Matthew Ramsey. All three thanked Bentley for his devotion to the craft of songwriting and for being open to cutting outside songs when he is such a talented writer himself. While McAnally was marking his eleventh No. 1 at the party, he was also basking in a twelfth charttopper—as a co-wrtier on Kenny Chesney’s “Wild Child” which hit No. 1 yesterday. Old Dominion bandmates Ramsey and Rosen were toasting their first and second No. 1s, respectively. In concert, the band performs “Say You Do” and have loved the thrill of fans singing it back to them. Rosen thanked McAnally for floating him with a monthly draw when he was between publishing deals. The no-strings-attached deal evolved into their publishing relationship. “I can’t even believe I get to be a part of this,” said Rosen. ASCAP’s Mike Sistad led the ceremony. Publishers Music Of RPM, Rehits Music, SMACKSongs, Sonic Geo Music and Universal Music Publishing were on hand to congratulate the group. “I stand in awe of your talent,” saluted Rehits’ Ree Guyer Buchanan. UMPG’s Cyndi Forman recalled loving the song so much she played the work tape over and over. Mike Dungan represented UMG Nashville. Charlie Monk spoke on behalf of the CRB. Riser producer Ross Copperman was there to celebrate as well. Ramsey also received words of wisdom from his grandfather before he moved to Nashville, who told him “to get lost on purpose.” In Ramsey’s early days he would drive around exploring the city. He’s still following that advice, but in a more metaphorical way. When McAnally showed up to write what would become “Say You Do,” he was working with the lines “Say you might/ For tonight,” but didn’t know where the lyrics were going. They decided to get lost on purpose and find out. Turns out it led straight to No. 1.